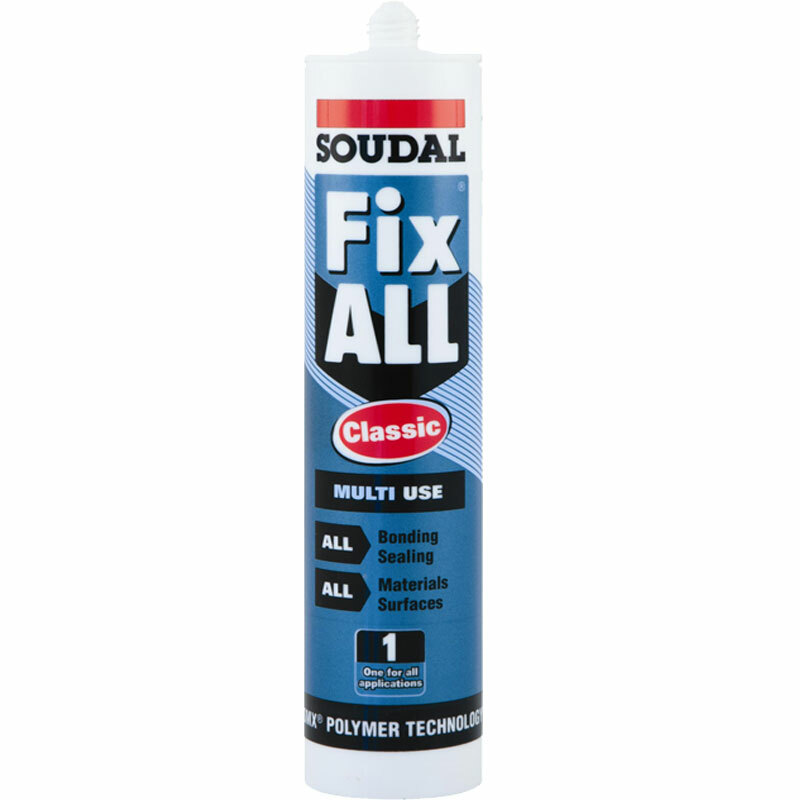 The Fix ALL range of products from Soudal are the perfect answer to all interior and exterior bonding, filling and sealing jobs. Use on porous , non-porous, wet and humid surfaces, even under water. 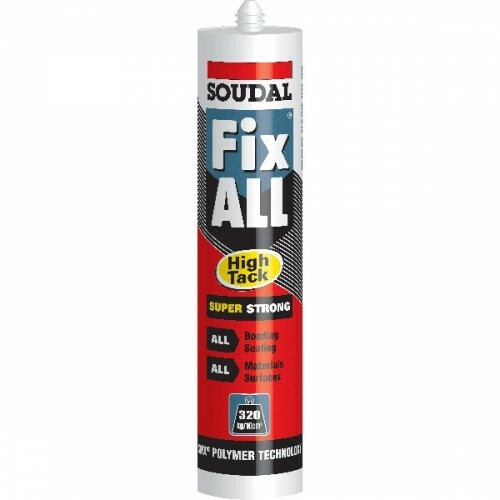 To view our complete range of Soudal Fix ALL Click Here. Super strong sealant, adhesive and filler. Very high initial tack. Can be applied in all weather conditions (including wet and damp surfaces), internally and externally. It contains no solvents and has no odour. Primerless adhesion on most construction materials. High tack is also overpaintable with most paints. Non staining on porous natural stones. Suitable for sanitary applications. For all bonding, sealing and filling applications where initial grab is important. Heavy duty bonding and sealing and all weather conditions, on most surfaces. Paintable elastomeric sealing and bonding. Bonding and sealing of porous natural stone surfaces such as marble and limestone. Sanitary sealing and bonding. High tack comes in a 290ml cartridge and is available in white, black, grey, brown and white colours. Multi use sealant, adhesive and filler. Can be applied in all weather conditions (including wet and damp surfaces), internally and externally. Classic has no solvents in it and produces no odour. 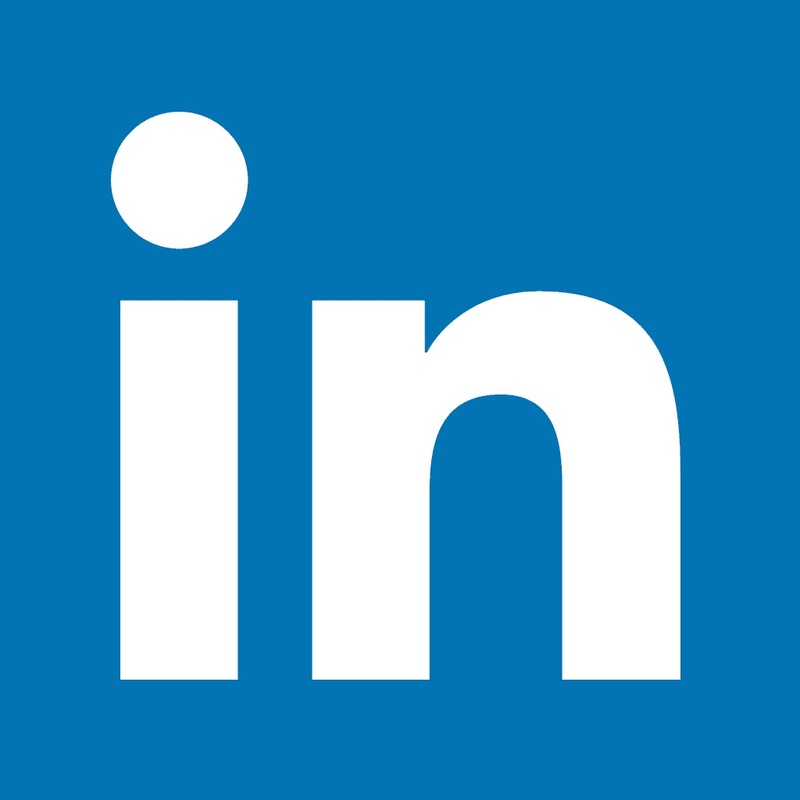 Primerless adhesion on most construction materials. Overpaintable with most paints. Non staining on porous natural stones. Suitable for sanitary applications. For all bonding, sealing & filling applications in all weather conditions, on most surfaces. Paintable on elastomeric sealing and bonding. Bonding and sealing of porous natural stone surfaces such as marble and limestone. Sanitary sealing and bonding for kitchens, bathrooms and showers. Classic comes in a 290ml cartridge and is available in white, black, grey, brown and white colours. 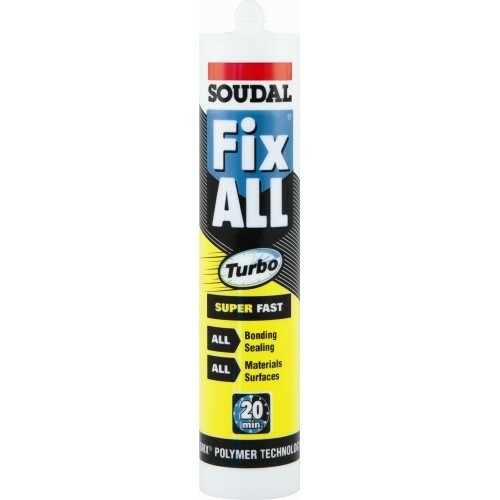 Super fast sealant, adhesive and filler. Maximum strength build up in the shortest possible time. High initial tack. Can be applied in all weather conditions (including wet and damp surfaces), internally and externally.No solvents or odours. Primerless adhesion on most construction materials. Overpaintable with most paints. Non staining on porous natural stones. Suitable for sanitary applications. For all bonding, sealing and filling applications where initial grab and adhesive build up speed is critical or important. Heavy duty bonding and sealing in all weather conditions, on most surfaces. Paintable elastomeric sealing and bonding. Bonding and sealing ofporous natural stone surfacessuch as marble and limestone. Sanitary sealing and bonding.